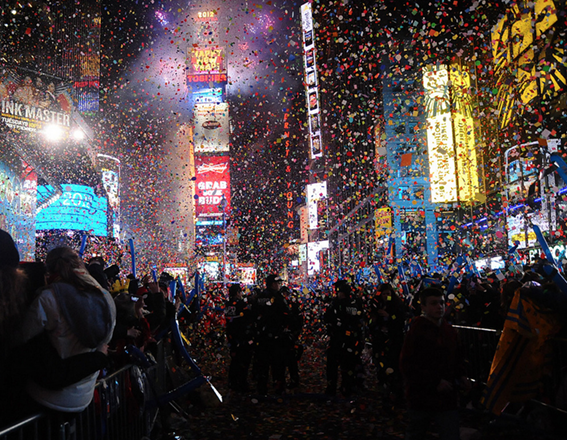 As the holiday festivities finish up and 2014 draws to a close, there is one more grand celebration that brings people into New York City for the New Year: the dropping of the New Year’s Eve ball in Times Square. Come on down This annual tradition began in 1907-1908, when New York Times’ owner, Alfred Ochs, threw a new year’s eve party of massive proportions. It was his way of bringing people up from Brooklyn and lower Manhattan to what was then Longacre Square. The party began with a street festival that lasted all day. Once it was dark, fireworks were set off, and the ball was dropped for the first time. It was an instant success that suddenly became a New Year’s tradition. Before that, people had gathered at Trinity Wall Street Church, awaiting the bells to chime that would “Ring out the old year, and ring in the new year.” But given the drunken and raucous behavior of the celebrants, the church was glad to hand over the New Year’s celebration to the New York Times. According to The New Yorker, the origin of using “time balls” to mark a point in time goes back to the early 1800s, when Captain Robert Wauchope thought of the idea of having naval observatories use visual signals to help ships recalibrate their chronometers. Chronometers were clocks used on ships to help approximate distance traveled over time. Although the time balls were ultimately believed impractical due to low visibility, the time ball became a more popular tradition inland. Alfred Ochs had Artkraft Strauss construct a time ball for One Times Square, which, at the time, was the tallest building in New York. But instead of dropping it every day at noon as other time balls had been used for, they just dropped it the once at midnight to celebrate the New Year. There were only two years that the ball did not drop: 1942 and 1943. During the war, New Yorkers maintained a “dimout” procedure to prevent German submarines from seeing the shore to attack it. In those two years, the congregated people had a moment of silence and then rang bells in the old tradition. According to Times Square New York, there have been 7 incarnations of the time ball. The first had one hundred 25-watt light bulbs, was 5 feet in diameter and weighed 700 pounds. The current incarnation has 32,256 Philips Luxeon LEDs, is twelve feet in diameter, weighs nearly 6 tons, and can create a kaleidoscope of colors to entrance and excite. So come to Time’s Square and see what the time ball will look like this year given its immense possibilities, and bring in the new year right with the roughly one billion people that come to Time’s Square or tune in on their television. But make sure to book your parking ahead of time, as it will be almost impossible to find parking within Manhattan on the night of the event. ABM Parking Services is now partnering with ParkJockey to provide locations right in the heart of Midtown, just a few steps away from the Museum of Modern Art. And spaces this good will not last long. ParkJockey also has garages available all throughout the Upper East and West sides as well as lower Manhattan. So book your parking for New Year’s now! Wherever you need to go, ParkJockey has you covered! Sign up now and use the promo code “NEWYEAR”, and new users will receive a discount on your next booking. But act quickly because once the ball drops, so does the promotion! This entry was posted in Chicago, Miami, New York, ParkJockey, PlumValet and tagged Alfred Ochs, Artkraft Strauss, chronometer, Manhattan, New Year, new york city, New York Times, parking, parkjockey, Robert Wauchope, time ball, time's square, trinity church on December 29, 2014 by ParkJockey Team.